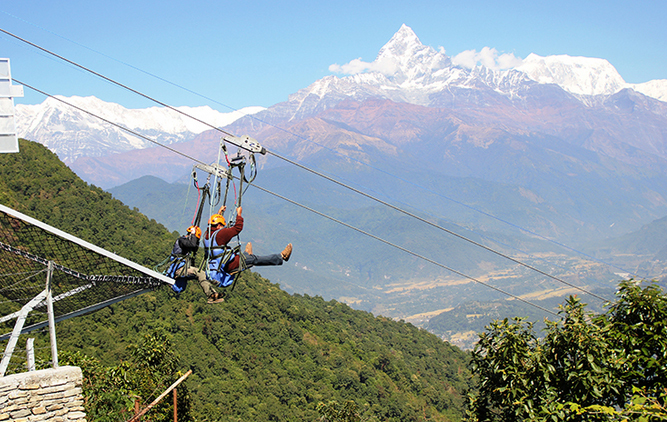 Zip Flyer in Nepal at 6,100 feet, (1.86 kms) is one of the longest in the world, and by far the steepest! Participants fly through the air for over a mile at speeds as high as 78 mph! This installation includes the Zip-Flyer harness system, which allows participants to fly in comfort over the course of the two minute ride. zip flyer in Nepal install has a G.R.S (Gear Retrieval System) which enables the rider equipment to be returned to the launch tower almost as fast as it came down with the rider. This is mostly relevant because of the gradient and difficult access to the launch. It’s a 45 min drive! Pokhara Nepal is the adventure capital of Nepal boasting more than 14 white water rafting companies and numerous trekking and mountain biking tour companies all based at the foothills of the Himalayas. Day 4 Drive to Sarangkot, prepare about the world's most incredible Zipline. Day 1 Arrival at Tribhuvan International Airport (TIA) Kathmandu. Welcome with bunch of flower assistance at the Airport and meet with our staff (One of our company staff will be waiting you at the Airport with display your name ".................." which is print on our company white board and pick up by our private car and than 20 minutes drive to the Hotel. After few minutes rest in hotel, Visit in our office and have hot/cold drinks (Tea/Coffee) waiting to serve and have join together, One of our staff will brief you regarding the trip and introduction with your trekking guide. O/N at hotel. - Nepal entry visa fee per person US$ 40 only. - Personal spending money and all bar bill, i.e. Soft/hard drinks, tips etc.